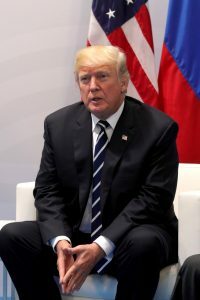 President Donald Trump made the case to the leaders of the Baltic nations Tuesday that the U.S. was “very tough on Russia,” pointing to U.S. support for increased defense spending by NATO countries as a check on Moscow’s aggression. Trump, joined by the presidents of Estonia, Latvia and Lithuania, spoke a day after the White House dangled the prospect of extending a White House welcome to Russian President Vladimir Putin. The three former Soviet states border Russia and are viewed as a bulwark against Russian incursions in Eastern Europe.